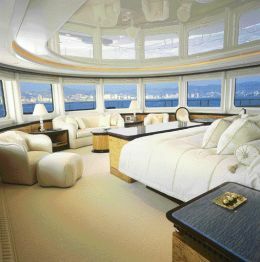 It must be wonderful to wake up early, open the curtains of your bedroom and gaze outside perhaps onto Capri, at the rocks changing colour in the mellow rays of the rising sun To enjoy a panorama of more than 180° while you lie comfortably in bed, in raptures at this really beautiful spectacle of nature. This scenario is perhaps not within everyonès reach, but it is certainly one in which the owners of 'Lady Lolà could find themselves. This is one of the newest leisure craft launched by the Oceanco shipyard which has its premises in Alblasserfam in Holland. One of the numerous features which make it special is the position of the owner's suite forward on the third deck, with windows on three sides overlooking a private terrace which is completely independent from the other areas. 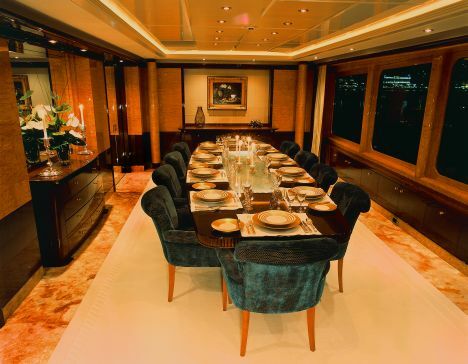 The same goes for the large saloon which takes up the entire width of the boat and the adjacent outdoor dining area, all on the same deck and forming part of the 'Owner's areà, structured in such a way as to guarantee maximum privacy to the owner. 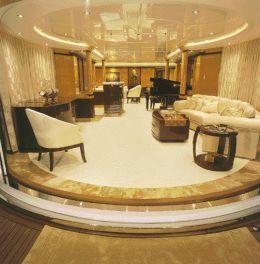 The interior, which exploits plenty of space and covers three decks as well as the "sun deck", was designed by the skilled hand of François Zuretti, the capricious and much sought-after French designer who is responsible for other important superyachts including some produced in Italy, all with resounding success. 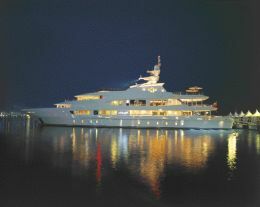 As regards the quickwork, structure and design of the exterior, these are the work of the shipyard itself. 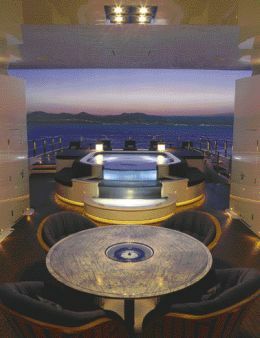 The main deck, in the bow area, features a special area for the skipper while towards the stern is a formal dining area with a table for 12 guests, the galley, in proportion to the size of the boat, and the main saloon, decorated luxuriously and arranged over several areas including a large, comfortable, elegant living area. 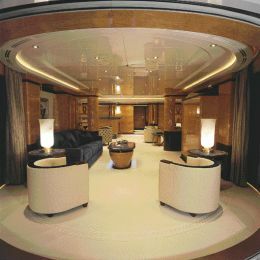 The cockpit, also large and conveniently linked to the inside areas by a large semi- circular door which can be opened completely, is furnished in a way which is practical and comfortable at the same time. The 'lower deck' on the other hand is used entirely for the night area: towards the stern the area is reserved for guests while separately in the bow area are the crew's quarters, sleeping a total of fourteen. The 'guest areà is made up of four cabins, all very large with en-suite bathrooms, three of which have double beds and one with twin beds. 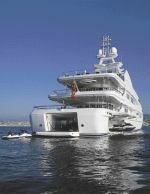 Lady Lola, as we mentioned, has three inside decks as well as a fly which is also very wide and structured in such a way as to serve occasionally as a helicopter landing base. This the owner had transformed into an outdoor recreation area where you can play games, listen to music, dance or simply relax in the sun. For the same activities there is an area called the "Beach Club", positioned towards the stern, dominated by a large swimming pool featuring tricks of water and served by a bar with a comfortable outdoor dining area. And to satisfy the owner's passion for golf there is even a mini training green on the sun deck. A small rectangular area with artificial grass appears by means of a servomechanism from under the teak lining, offering an opportunity to try your hand with clubs and balls. The space reserved for the stern hangar, or the lazarette, as it's called, is really impressive and is big enough for two tenders or one tender and a jetbike as well as a lot of other material for water sports. To favour the movement of support craft, the yacht has two distinct openings, one on the starboard side and the other astern which when flat forms a huge, comfortable swimming platform.